Abstract: Interest in development of affordable sensors and analytical tools led to the emergence of lab-on-chip devices with a significant jump driven by development of soft-lithography. The need for sustainable and frugal approaches to sensor and analytical tools development has led to emergence of affordable flexible substrates like paper. A major challenge with these substrates is the inability to automate fluidic transport especially in capillary driven systems. Sensitivity to heat implies that incorporation of well-known electrical components is nearly impossible since they cannot be soldered onto the substrates. To mitigate these challenges, first, we developed affordable methods of controlling fluid flow on paper substrates by creating hydrophobic barriers only where needed in the so called ‘draw-your-assay’ technique. To supplement this method, we developed a two-way valve that allows for automated and programmable delivery of fluids across multiple channels opening the potential for ‘lab-on-paper’ devices. In a second effort, we focused on integration of conventional electronic components in the fabrication of devices on flexible substrates. To achieve this, we developed heat-free solder that can be activated by mechanical or chemical stimuli. This methods allows rapid prototyping of electronic devices on flexible substrates either by drawing or screen printing. This talk will discuss both developments and introduce new sensing approaches based on coherent charge tunneling that we are currently pursuing. 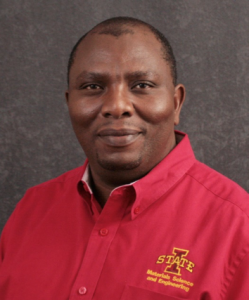 Bio: Since 2014, Martin Thuo has been an Assistant Professor in the Department of Materials Science and Engineering at ISU. He received his Ph.D. from the University of Iowa in 2008. He then worked and was a Mary-Fieser (2009-2011) and NSEC (2011-2013) Fellow at Harvard University under the tutelage of Prof. George M. Whitesides. He is the recipient of a number of awards like the Lynn-Anderson research excellence award (2008) and the Black & Veatch faculty fellowship (2014), among others. His research interests encompass the general theme of frugal innovation through simplicity, for which he has over 50 publications.